Astronomer Ed Shaya was in his office looking at data from NASA’s Kepler space telescope in 2012 when he noticed something unusual: The light from a galaxy had quickly brightened by 10 percent. The sudden bump in light got Shaya instantly excited, but also nervous. The effect could be explained by the massive explosion of a star — a supernova! — or, more troublingly, a computer error. Stellar explosions forge and distribute materials that make up the world in which we live, and also hold clues to how fast the universe is expanding. By understanding supernovae, scientists can unlock mysteries that are key to what we are made of and the fate of our universe. But to get the full picture, scientists must observe supernovae from a variety of perspectives, especially in the first moments of the explosion. That’s really difficult — there’s no telling when or where a supernova might happen next. A small group of astronomers, including Shaya, realized Kepler could offer a new technique for supernova-hunting. Launched in 2009, Kepler is best known for having discovered thousands of exoplanets. But as a telescope that stares at single patches of space for long periods of time, it can capture a vast trove of other cosmic treasures –especially the kind that change rapidly or pop in and out of view, like supernovae. Originally, Shaya and colleagues were looking for active galactic nuclei in their Kepler data. An active galactic nucleus is an extremely bright area at the center of a galaxy where a voracious black hole is surrounded by a disk of hot gas. They had thought about searching for supernovae, but since supernovae are such rare events, they didn’t mention it in their proposal. “It was too iffy,” Shaya said. 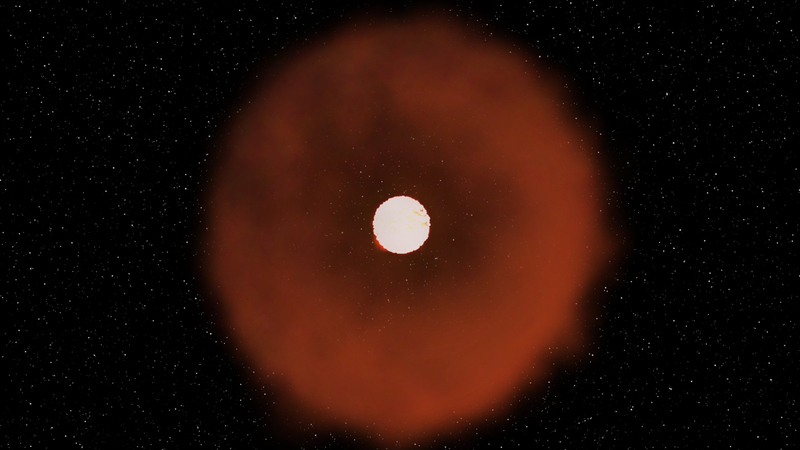 Unsure if the supernova signal he found was real, Shaya and his University of Maryland colleague Robert Olling spent months developing software to better calibrate Kepler data, taking into account variations in temperature and pointing of the instrument. Still, the supernova signal persisted. In fact, they found five more supernovae in their Kepler sample of more than 400 galaxies. When Olling showed one of the signals to Armin Rest, who is now an astronomer at the Space Telescope Science Institute in Baltlimore, Rest’s jaw dropped. “I started to drool,” he said. The door had opened to a new way of tracking and understanding stellar explosions. Today, these astronomers are part of the Kepler Extra-Galactic Survey, a collaboration between seven scientists in the United States, Australia and Chile looking for supernovae and active galactic nuclei to explore the physics of our universe. To date, they have found more than 20 supernovae using data from the Kepler spacecraft, including an exotic type reported by Rest in a new study in Nature Astronomy. Many more are currently being recorded by Kepler’s ongoing observations. “We have some of the best-understood supernovae,” said Brad Tucker, astronomer at the Mt. Stromlo Observatory at the Australian National University, who is part of the Kepler Extra-Galactic Survey. The first kind, called “type Ia” (pronounced as “one a”) is special because the intrinsic brightness of each of these supernovae is almost the same. Astronomers have used this standard property to measure the expansion of the universe and found the more distant supernovae were less bright than expected. This indicated they were farther away than scientists had thought, as the light had become stretched out over expanding space. This proved that the universe is expanding at an accelerating rate and earned those researchers the Nobel Prize in 2011. The leading theory is that a mysterious force called “dark energy” is pushing everything in the universe apart from everything else, faster and faster. But as astronomers find more and more examples of type Ia explosions, including with Kepler, they realize not all are created equal. While some of these supernovae happen when a white dwarf robs its companion of too much matter, others are the result of two white dwarfs merging. In fact, the white dwarf mergers may be more common. More supernova research with Kepler will help astronomers on a quest to find out if different type Ia mechanisms result in some supernovae being brighter than others — which would throw a wrench into how they are used to measure the universe’s expansion. “To get a better idea of constraining dark energy, we have to understand better how these type Ia supernovae are formed,” Rest said. Another kind of supernova, the “core collapse” variety, happens when a massive star ends its life in an explosion. This includes “Type II” supernovae. These supernovae have a characteristic shockwave called the “shock breakout,” which was captured for the first time in optical light by Kepler. The Kepler Extra-Galactic Survey team, led by team member Peter Garnavich, an astrophysics professor at the University of Notre Dame in Indiana, spotted this shock breakout in 2011 Kepler data from a supernova called KSN 2011d, an explosion from a star roughly 500 times the size of our Sun. Surprisingly, the team did not find a shock breakout in a smaller type II supernova called KSN 2011a, whose star was 300 times the size of the Sun — but instead found the supernova nestled in a layer of dust, suggesting that there is diversity in type II stellar explosions, too. Kepler data have revealed other mysteries about supernovae. The new study led by Rest in Nature Astronomy describes a supernova from data captured by Kepler’s extended mission, called K2, that reaches its peak brightness in just a little over two days, about 10 times less than others take. It is the most extreme known example of a “fast-evolving luminous transient” (FELT) supernova. FELTs are about as bright as the type Ia variety, but rise in less than 10 days and fade in about 30. It is possible that the star spewed out a dense shell of gas about a year before the explosion, and when the supernova happened, ejected material hit the shell. The energy released in that collision would explain the quick brightening. Telescopes on Earth offer a lot of information about exploding stars, but only over short periods of time — and only when the Sun goes down and the sky is clear – so it’s hard to document the “before” and “after” effects of these explosions. Kepler, on the other hand, offers astronomers the rare opportunity to monitor single patches of sky continuously for months, like a car’s dashboard camera that is always recording. In fact, the primary Kepler mission, which ran from 2009 to 2013, delivered four years of observations of the same field of view, snapping a picture about every 30 minutes. In the extended K2 mission, the telescope is holding its gaze steady for up to about three months. With ground-based telescopes, astronomers can tell the supernova’s color and how it changes with time, which lets them figure out what chemicals are present in the explosion. 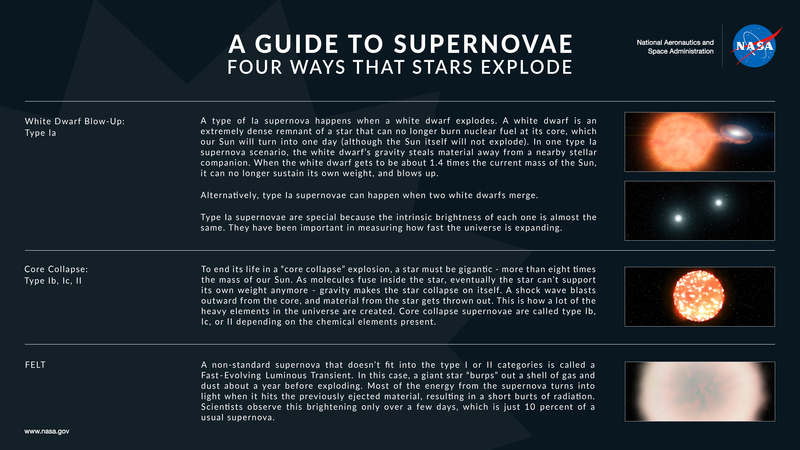 The supernova’s composition helps determine the type of star that exploded. Kepler, on the other hand, reveals how and why the star explodes, and the details of how the explosion progresses. Using the two datasets together, astronomers can get fuller pictures of supernovae behavior than ever before. Kepler mission planners revived the telescope in 2013, after the malfunction of the second of its four reaction wheels — devices that help control the orientation of the spacecraft. In the configuration called K2, it needs to rotate every three months or so — marking observing “campaigns.” Members of the Kepler Extra-Galactic Survey made the case that in the K2 mission, Kepler could still monitor supernovae and other exotic, distant astrophysical objects, in addition to exoplanets. A recent possible sighting got astronomers riled up on Super Bowl Sunday this year, even if they weren’t into the game. On that “super” day, the All Sky Automated Survey for SuperNovae (ASASSN) reported a supernova in the same nearby galaxy Kepler was monitoring. This is just one of many candidate events that scientists are excited to follow up on and perhaps use to better understand the secrets of the universe. A few more supernovae may come from NASA’s Transiting Exoplanet Survey Satellite, (TESS) which is expected to launch on April 16. In the meantime, scientists will have a lot of work ahead of them once they receive the full dataset from K2’s supernova-focused campaigns. “It will be a treasure trove of supernova information for years to come,” Tucker said.